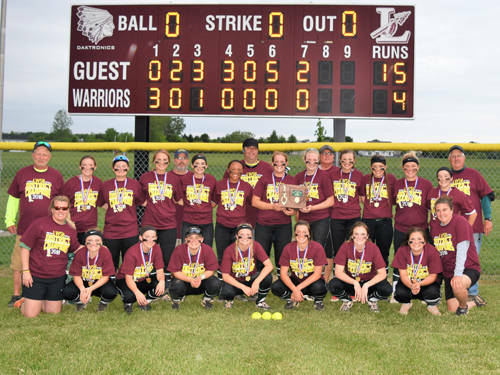 The Greenville softball team won an Ohio High School Athletic Association district championship in 2018. GREENVILLE – Greenville recognized its spring sports athletes with special awards for the 2018 season. In baseball Landon Eldridge was named the best offensive player, Marcus Wood was named the best defensive player, and Kyle Mills was named the best pitcher. Cameron Kaiser earned the Wave Award, and Owen Paulus received the Coaches Award. For the softball team Sydney Grote and Cassie Cromwell were named the best offensive players, Chloe Sowry and Lani Shilt were named the best defensive players, and Caitlin Christman and Grace Shaffer were named the best pitchers. Cassie Cromwell and Morgan Gilbert shared The Tab award for the highest batting average of .506, and Megan Johnston received the Extra Miles with Class “Arnie” award. Morgan Gilbert was recognized for having the most RBIs. For the boys track and field team Foster Cole was named the most valuable performer overall, Alex Hutt was named the most valuable sprinter/hurdler, Addison Ernst was named the most valuable thrower, Andrew Kocher was named the most valuable distance runner, and Ryan Trick was named the most valuable jumper. Riley Emerick was named the Rookie of the Year, and Matt Hounshell was recognized as most improved. In girls track and field Emma Klosterman was named the most valuable performer overall, Hope Byrum was named the most valuable sprinter/hurdler, Sierra Cress was named the most valuable thrower, Grace Coakley was named the most valuable distance runner, and Payton Brandenburg and Riley Hunt shared the most valuable jumper honor. Izzy Rammel earned the Rookie of the Year award while Kyia Richards was named most improved. In boys tennis Branson Leigeber was named the team MVP. Aaron Lobenstein earned the sportsmanship award while Max Onkst, Duda Wollmeister and Zach Miller shared the Coaches Award. Payton Bradenburg in girls track, Hope Byrum in girls track, Grace Coakley in girls track, Sierra Cress in girls track, Isabel Elliott in girls track, Emma Jennings in girls track, Hayley Maher in girls track, Landin Brown in boys track, Alex Chui in boys track, Matthew Hounshell in boys track, Andrew Kocher in boys track, Tanner Swisshelm in boys track, Ryan Trick in boys track, Cassie Cromwell in softball, Sydney Grote in softball and Kyle Mills in baseball were recognized as four-year letter winners. This entry was tagged Baseball, Greenville, GWOC, Softball, Tennis, Track, Track and field. Bookmark the permalink.